Astrology : The comparison of birth charts or Synastry. "The heart has its reasons which reason knows nothing of"
The Synastry is the study of the comparison of two birth charts. Both sky charts are compared by taking into account first of all the planetary interaspects, but also superimposed positions in houses. It helps understand how this connection works and makes it easier to understand why it works and why it sometimes does not. 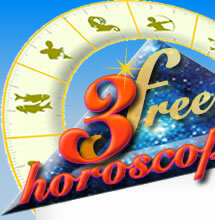 However, contrary to popular belief, the synastry won't be able to give some details about the future of a relationship! It only gives a better understanding of the qualities and flaws of the people involved in order to show who is compatible and who's not as much. The analysis of a comparison of birth charts will bring out some tendencies but it will never tell people about the future of their relationship. The future of your relationship depends on your ability to maintain it or not, but never on an astrological analysis! Astrological compatibility in a relationship is all a matter of heart. Only love will solve any difficulties encountered in a relationship. 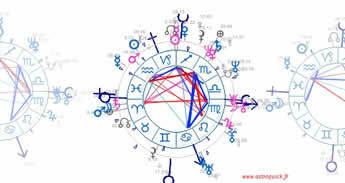 It's best to consider astrological synastry as a way to know ourselves and our partner better and to become aware of the qualities and specificities of this relationship.